If you have ever wanted to get an insight into the hip-hop industry but aren’t ready to endorse the ride until we die motto, then you can now get a taste of the glamorous life with Play’n Go’s gangster themed video slot. Play’n Go has created a game centred around the world of pimping. Two of the characters have been said to look like Snoop Dogg and Xzhibit but we don’t want to make any assumptions. Regardless, the pair have made a song about pimping and are clearly doing quite well for themselves since there seems to be cash coming from all corners of the play screen. This slot has been created by a software developer which makes its games available on all platforms meaning we can play Pimped any time we want, but perhaps not while we are riding as we all might start dying. Play’n Go have been on the gaming scene since 1997 and are based in Sweden. They make games which are both desktop and mobile compatible so this new game is available to play on our smartphone and tablets, as well as our desktop and laptop computers. They are prominent in the online gaming world and their games are available at several of our favourite online casinos, including those recommended in the casino table above. Play’n Go is dedicated to making innovative slots and Pimped is no exception. 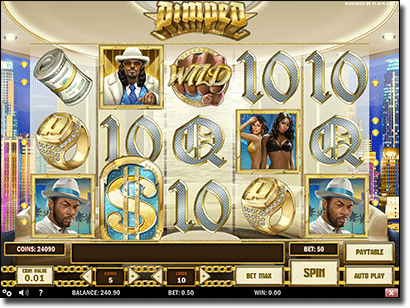 Pimped features a 10 payline slot with 5-reels, and is quite glamorous with its glorified gangsters, attractive women, large wads of cash, diamond rings, and the usual 10 to Ace icons lining the reels. With only 10 paylines in this pokies game players can feel quite limited however we have the option to be quite flexible with our bets with an option to put five coins on from 0.01 right up to two credits per line. 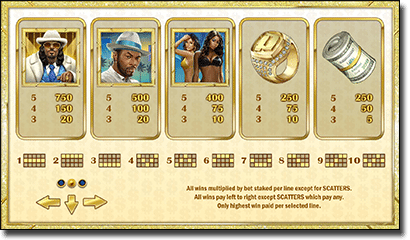 There is a gamble feature which allows players to multiple their winnings by two or even four just by guessing the colours and suits of certain cards, as many classic slots offer. Players also have the ability to win up to one million coins but this is dependant on the size of their bet. The blue suit character pays the most while the second-highest amount payout comes from the other pimped out male. The two attractive females in the one symbol on the reels pay the least. Brass knuckles feature as the wild symbol and Play’n Go use innovative graphics to show these knuckles punching the screen when they show up on the reels. They also can activate a Stacked Wild meaning all symbols, albeit the Scatter symbols, are replaced to fulfil any winning combinations that may appear. If you hit three or more of the Scatter symbols which are the dollar signs then you can trigger a free spin bonus round where you can earn up to five free spins with a definite win ensured on each spin. Additionally, if you hit a dollar sign during any of these free spins you will be rewarded two more free spins. Or take advantage of the Win Spins, which Play’n Go have fittingly named, where you can re-trigger the free spins during the bonus spin round if you hit three more more dollar signs. The introduction which occurs as soon as you open the game sets the scene for the Pimped pokies with a long, gold, lounge which is situated in a room with an expensive view of a city. This tells the tale that gangsters live the high life and is confirmed when money begins to float around the screen adding to the ambience. You can skip this intro and the rules and extra spins which are listed at the beginning prior to the game if you aren’t one for patience. The audio is one of the best features about this game. It isn’t over the top and fits the theme accordingly. The bling theme is represented by the crystal clear graphics and appears quite luxurious. Since Play’n Go is one of the leading software developers in mobile compatible games, it’s no surprise that pimped is available via our smartphones or tablets. Head to one of our recommended Play’n Go online casinos such as Slots Million and House of Jack online casino and tap on the title after you have signed up or logged in, both of which you can do via your portable device. From here it will open and all the same graphics and audio that you see on your desktop computer will appear so you can play the Pimped slot without compromising the games novel features. You can also fund your account to play Pimped with real money via your smartphone or tablet. Just go to the banking page, pick a trusted payment method, fill out the required details and click confirm. Although you are playing on your smartphone or tablet you are still making transactions using the same level of data encryption technology as laptop versions of reputable online casinos have so you won’t be compromising the security of your personal information. We like Pimped for its novel theme, intriguing soundtrack, and the fact your can play it on any platform. We see it as a contemporary version of Microgaming’s Loaded slot as the graphics are improved and the audio isn’t as boisterous yet the same theme idea is there. The best feature to Pimped however is that players can win up to one million coins making it a potential competitor in the realm of an over-populated slots environment.